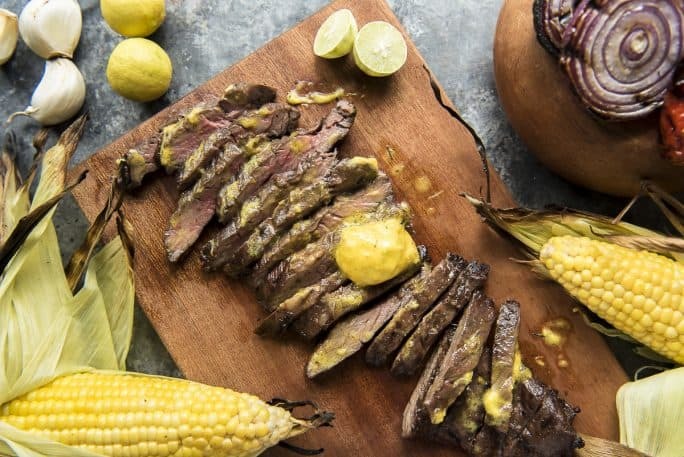 This flavor-packed Grilled Skirt Steak with Mojo Mustard Butter will be the star of your summer entertaining! 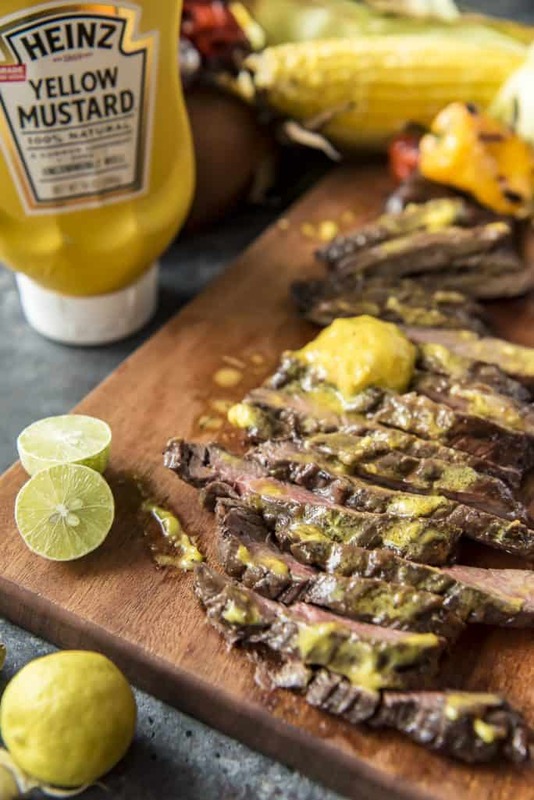 Citrus and garlic-marinated skirt steak is grilled to perfection, then slathered in a Cuban mojo and mustard-flavored butter. This post has been sponsored by the Kraft Heinz Company. All thoughts and opinions are my own. Thank you for supporting the brands that make this blog possible! It’s officially grilling season at our house. If I’m being honest, we Floridians can get away with grilling all year long, but it feels weird outside of summertime. And while we’re speaking truths, grilling is probably one of the only things I like about summer. It’s beyond hot, humid, and riddled with mosquitos outside – but somehow, all of that is bearable when you’re sitting down to a delicious meal hot off the coals. 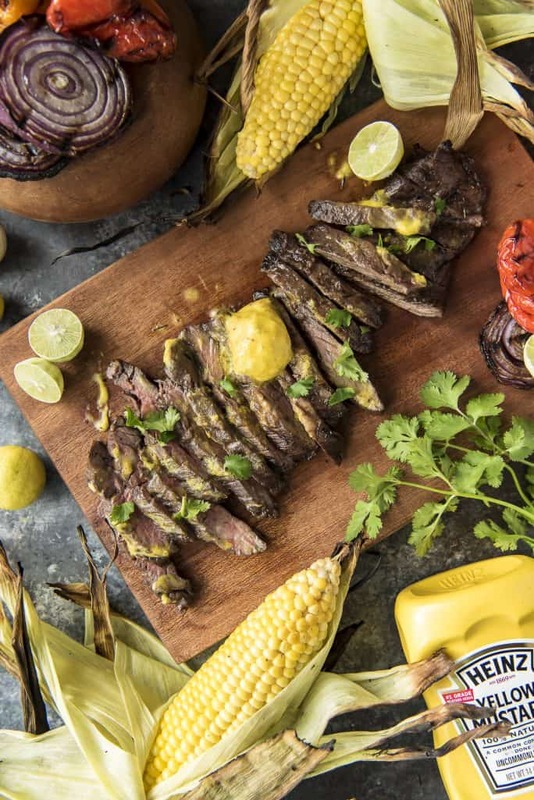 Especially if it’s a Grilled Skirt Steak with Mojo Mustard Butter. 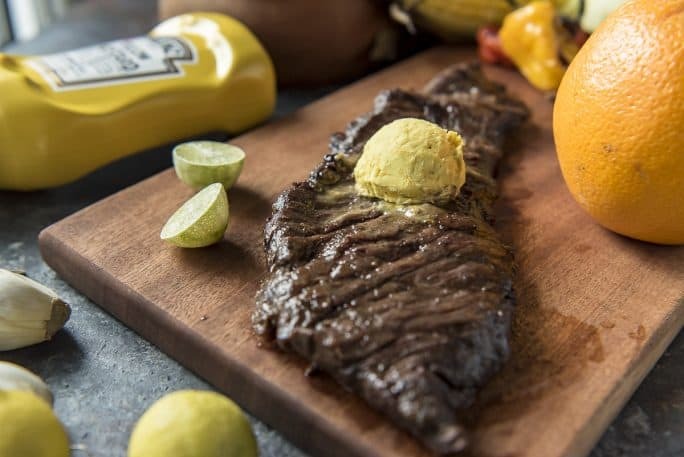 Abe’s favorite cut of beef, second only to the mighty ribeye, is the skirt steak. I’ve never shared his intense love of the cut, but I have to admit that this recipe is making me come around. 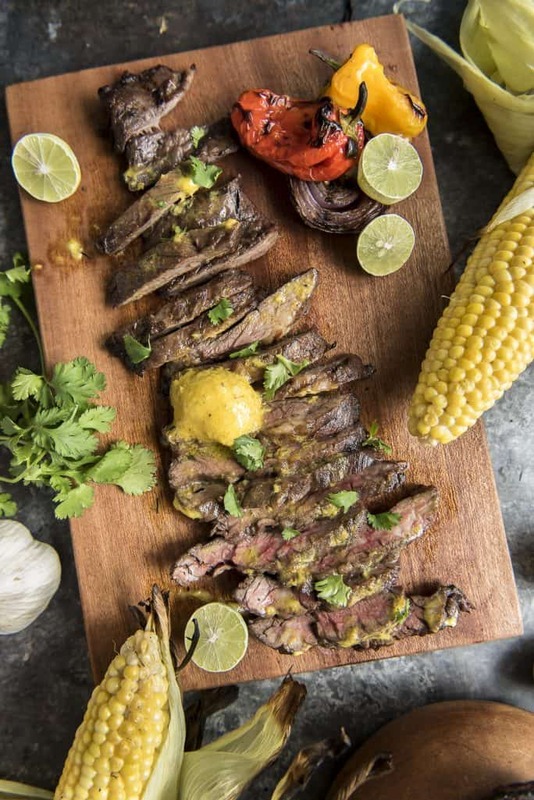 Skirt steak is adored for its flavor, something that shines through when it’s prepared properly with a good marinade and a hot grill. It is often braised, but summer calls for everything to be cooked over propane or charcoal, so here we are. The season also requires a healthy dose of condiments, especially that bright, sunshiney bottle of Heinz Yellow Mustard. 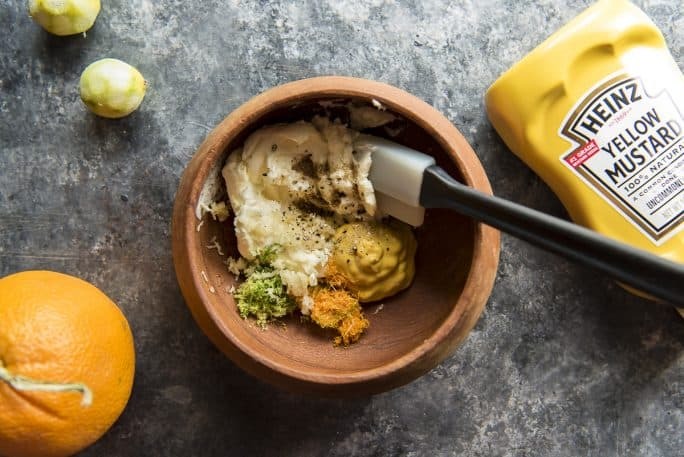 I was looking for unique flavor in this compound butter topping, and mustard was just the ticket. Compound butter sounds complicated, but it’s actually one of the easiest ways to enhance your food flavors! You can use any leftover butter on grilled chicken, pork chops, corn on the cob and other grilled veggies. 1. In a small bowl, combine butter, garlic, Heinz Yellow Mustard, orange and lime zest, cumin, salt, and pepper. Use a spatula to combine all of the ingredients completely. 2. Scoop the mixture into a pile on a sheet of parchment paper. Roll into a log and twist the ends shut. Alternatively, you can use a small cookie scoop to create individual balls for easy serving. Place the balls on the parchment and cover with another sheet, then fold up the edges to seal. 3. Place in the refrigerator for 2 hours (or freeze for 45 minutes), or until the butter is firm. 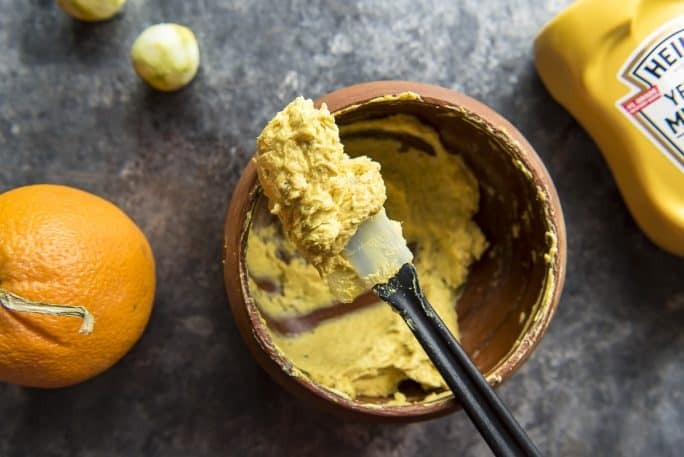 Compound butters are so easy to throw together, especially when you can pick up everything you need for them at one place – Publix. 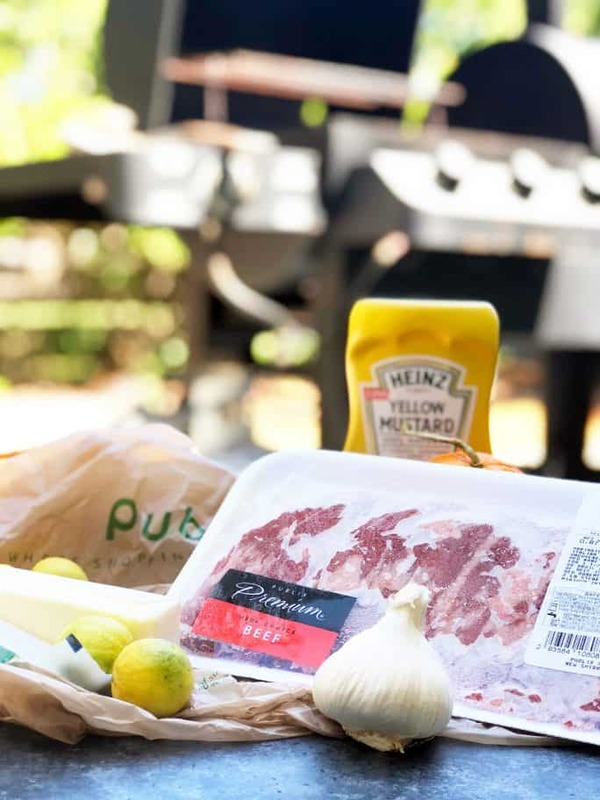 Whether you’re prepping a picnic or getting family together for a backyard BBQ, Publix has everything you need for your outdoor festivities. All of your favorite brands (including their amazing private line) can be found in their aisles, and you’re bound to leave with more than what’s on your list. To sweeten the deal, Publix is giving away 5 $100 gift cards to help with your summer party planning – you can enter to win at the bottom of this post! • Bell peppers, sweet peppers, or poblanos. 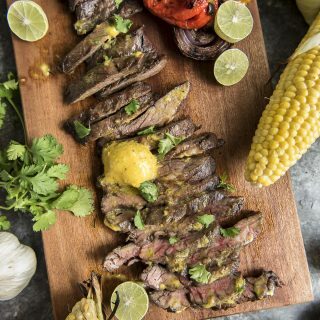 To mix it up, you could also serve this grilled skirt steak on top of a nutritious salad, as the star of a burrito bowl, or in filling summer fajitas. 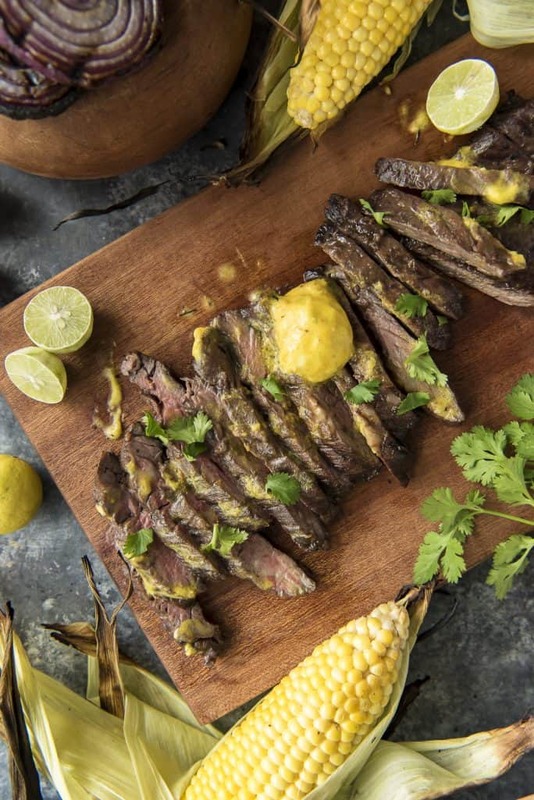 How do you cook a skirt steak? 1. Season the steak liberally with salt and pepper. Combine the garlic cloves, cumin, and oregano in a mortar and crush them together with the pestle (alternatively, simply mince the garlic.) In a mixing bowl, whisk together the lime juice, orange juice, water, and olive oil, then add the crushed garlic and spices. 2. Place the steaks in a plastic zipper bag and pour the marinade into it. Marinate in the refrigerator for a minimum of 2 hours, or overnight. 3. Remove the steaks from the fridge and allow to sit at room temperature for 30 minutes. Heat a grill over medium-high heat. 4. Place the steaks on the grill and cook 2 to 4 minutes per side to the desired doneness, until the meat has grill marks. 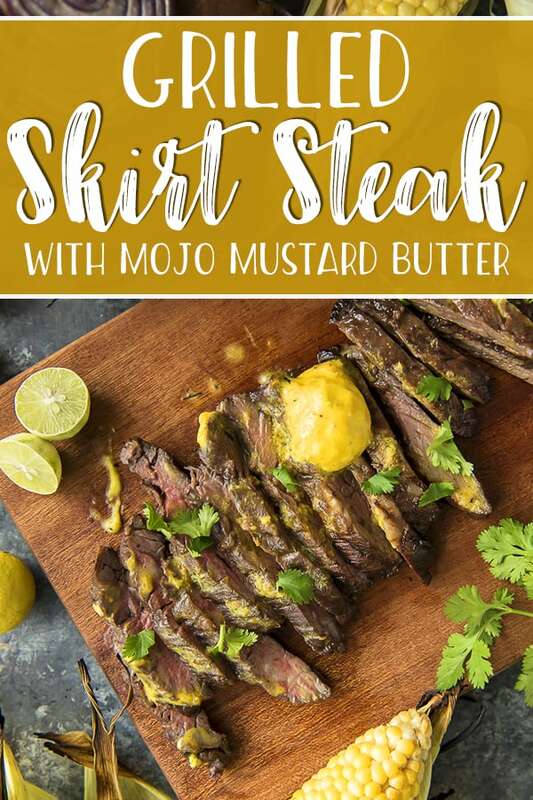 Remove the steaks from the grill and wrap them in foil or parchment, set a pat or two of Mojo Mustard Butter on each, then let them rest for 10 minutes. Slice against the grain and serve with grilled corn and summer veggies. ENTER TO WIN SOME $$$ FROM Publix! To create everyday celebrations, visit YourRecipeForHappiness.com. In a small bowl, combine butter, garlic, mustard, orange and lime zest, cumin, salt, and pepper. Use a spatula to combine all of the ingredients completely. Scoop the mixture into a pile on a sheet of parchment paper. Roll into a log and twist the ends shut. Alternatively, you can use a small cookie scoop to create individual balls for easy serving. Place the balls on the parchment and cover with another sheet, then fold up the edges to seal. Place in the refrigerator for 2 hours (or freeze for 45 minutes), or until the butter is firm. This recipe will make extra butter; simply freeze or refrigerate any that is not used for up to 3 months. Season the steak liberally with salt and pepper. Combine the garlic cloves, cumin, and oregano in a mortar and crush them together with the pestle (alternatively, simply mince the garlic.) In a mixing bowl, whisk together the lime juice, orange juice, water, and olive oil, then add the crushed garlic and spices. Place the steaks in a plastic zipper bag and pour the marinade into it. Marinate in the refrigerator for a minimum of 2 hours, or overnight. Remove the steaks from the fridge and allow to sit at room temperature for 30 minutes. Heat a grill over medium-high heat. Place the steaks on the grill and cook 2 to 4 minutes per side to the desired doneness, until the meat has grill marks. Remove the steaks from the grill and wrap them in foil or parchment, set a pat or two of Mojo Mustard Butter on each, then let them rest for 10 minutes. Slice against the grain and serve with grilled corn and summer veggies. 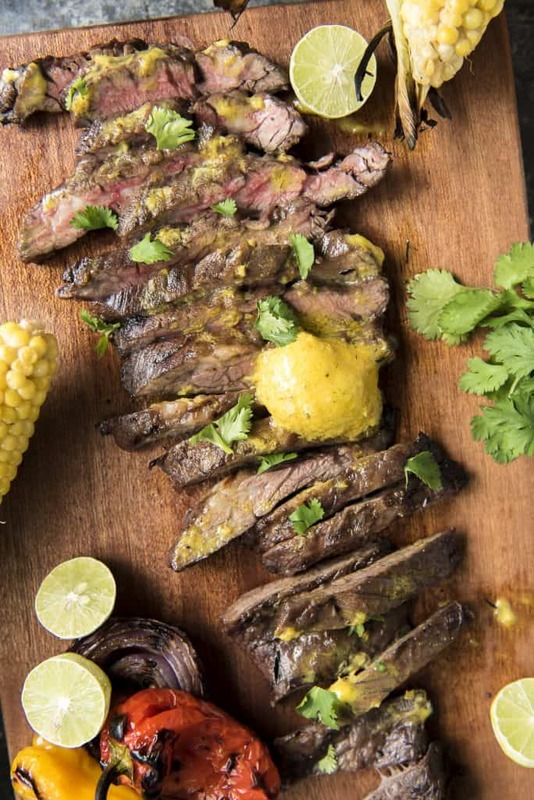 PIN THIS GRILLED SKIRT STEAK RECIPE FOR LATER! This is a sponsored post written by me on behalf of the Kraft Heinz Company. This looks so good’! I can’t wait to try this recipe.